Every once in a while we have the opportunity to witness something really special. When this happens we should always remember these examples of how people can be truly good because they are rare and we always need role models in our lives. This summer folks at the ARHA World Show had the opportunity to witness a young lady from Pleasant Shade, Tennessee be just that kind of example. Leah Piper, who had a birthday and turned 16 during the World Show, was asked to be a partner with Natalie Sandridge from Virginia in the Youth Ranch Sorting. Leah already had a partner who she planned to sort with on her own horse, True Rey Hickory. Chris Harris, another ARHA member from Virginia, and her dad, Mike’s Amateur Sorting Partner, asked Leah to sort with his horse, JC Hollywood Cindy. Leah agreed – she and Natalie entered the Youth Sorting as a team. Everyone who watched the sorting that morning knows that it was quite an exciting competition. Leah and Natalie prevailed and won a World Championship in Youth Sorting together. Leah did not do as well on her own horse, but was honored to do this well on Chris’s horse, Cindy. Chris Harris, his wife Sandy, and their daughter Skylar come to the ARHA World Show as their family vacation. They enjoy every aspect of being there – the competition and the camaraderie. Chris is outgoing and friendly, and enjoys the type of horse show atmosphere produced by the ARHA. Chris and Sandy’s daughter, Skylar is 21 and has Cerebral Palsy. Skylar is very bright and has graduated from high school. She is continuing her education through a program in the local school district and goes to a post graduate program daily during the school year. She did participate in a therapeutic riding program and loves horses. Her experience made her stronger and she loves animals. 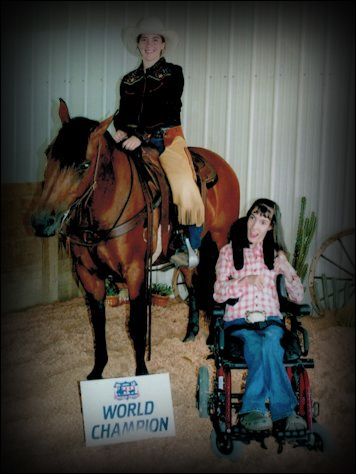 Skylar could not show horses from a wheelchair, so she raised and showed sheep until she aged out of 4H and FFA. Then Skylar required spinal surgery and riding became very painful for her. She still enjoys being a spectator and her family believes that she is cheering them on when they show. Those who know Leah Piper know what an outstanding young woman she is. She is kind, talented, and loves to have a good time. She is also a fierce competitor, so winning a World Championship buckle was a great accomplishment to her. Leah was very thankful that she was able to win this class – but realized it was not all of her own doing. She went over and presented her buckle to Chris’s daughter, Skylar. Leah felt that the Harris family had really helped her win this class, and that Skylar should be the recipient of the World Championship honors. Chris will tell you that he was overwhelmed by her actions. He told Leah the she had earned that buckle, but she insisted that it really belonged to Skylar. Chris and Sandy are thankful that they have friends who think more of others than of themselves. They believe that the Pipers have raised a wonderful daughter. Skylar loves this buckle – it is her favorite piece of jewelry. She wears it with pride and knows how special it is. Chris says that if more people in the world were like Leah we would all be better off. Leah did this quietly, on her own, and with no great fanfare. Many of us believe this is true ARHA sportsmanship at its best. Everyone in the ARHA wants Leah to know that she is a role model for us all and that she brightened the memories of many folks by her heartfelt thoughtfulness.